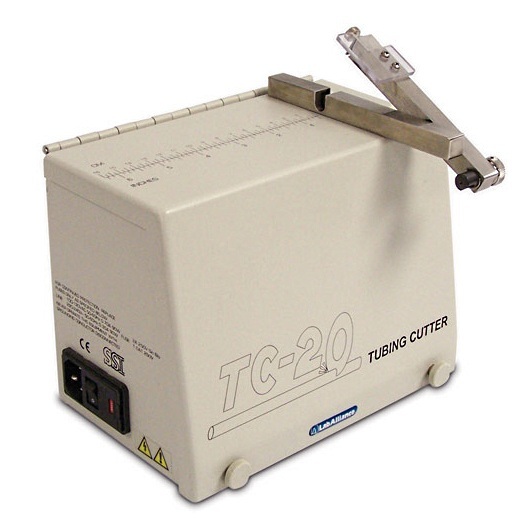 The redesigned TC-20 Tube Cutter makes it simple to get zero-dead-volume connections throughout the fluid path. It produces a square cut and a finished end when the swing arm is lowered against the abrasive cutting wheel. No cutting fluid required. A zero dead volume connection is important for maximum chromatographic performance. Un-swept volume, caused by a poor fit between tubing and the mating seat, can cause sample dispersion and unsatisfactory chromatographic results. Poor fit of the tubing can be due to a cut edge that is not square, or by improper de-burring. Burrs may prevent the tubing from fully seating and may restrict the internal diameter. Clean square cuts without distortions, assuring zero dead volume connections.